Add a unique look to the front end of your JL! 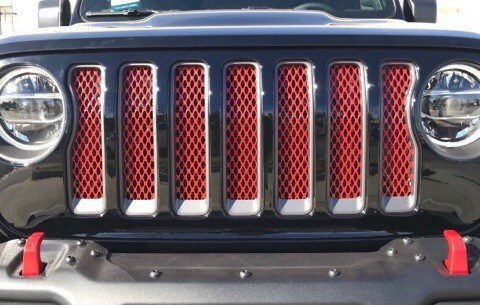 Here we have our 'NE-Route' 1pc Steel Mesh Grille Insert. This grille will enhance your Jeep Wrangler attitude, add a distinctive, unique look and it also protects your radiator from rocks and road debris when driving and off-roading. Grille installs as an insert, using custom flange brackets to secure the fitment and the original OE bolts. This steel grille is formed to go with the curvature of the JEEP JL, grille shell. This grille comes standard in RUBICON RED, to match any red trims or the original red insert of the Rubicon or simply to make a statement! Grille is also available in a standard Satin Textured Black, Semi-Gloss Black or Primer Only. For a custom powder coated finish on your grille, please contact us prior to ordering. Ablaze Grilles Inc. proudly designs, maufactures & finishes in California! !